Bus 1 is one of several bus services connecting the City of Hamilton and St George (the others are 3, 10, and 11). After leaving the Central Terminal in Hamilton, the buses on this route travel along East Broadway, past the BUEI, and into Paget Parish where they call at the King Edward VII Memorial Hospital. Buses then head along the South Road towards Tucker’s Town. Places of interest on the way include the Bermuda Botanical Gardens (also home to Masterworks and Camden), Palm Grove Gardens, Devonshire Bay Park, Verdmont, Spittal Pond, and John Smith’s Bay. On reaching Tucker’s Town the route heads north, passing Rosewood Tucker’s Point, and then along Harrington Sound Road and Wilkinson Avenue. The Crystal Caves are here and well worth a visit. Buses then call at the Swizzle Inn, Grotto Bay Beach Resort and Blue Hole Park, before heading over the Causeway to LF Wade International Airport. The historic town of St George is the final destination. There’s lots of interesting sights here including the Bermuda National Trust Museum, the Bermuda Perfumery, the replica of the Deliverance, the Unfinished Church, St Peter’s Church, the Old Rectory, and the State House. Some of the attractions in St Georges Parish (such as Fort St Catherine, Achilles Bay Beach, Tobacco Bay Beach, and St Catherine’s Beach) are a 15 minute walk from the bus stop in St George. If you don’t fancy the walk, a private minibus service operates from King’s Square in the town centre. Fares are just a few dollars. There’s also a taxi stand on King’s Square. 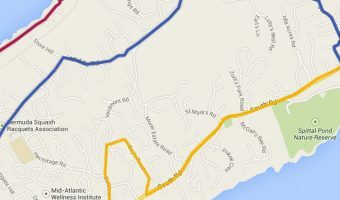 Passengers should note that some buses on Route 1 only go as far as Grotto Bay. Check the official timetable or the sign on the bus for clarification. Bus 1 runs approximately every 30 minutes with services starting from Hamilton at 6.45 am. The entire journey from Hamilton to St George takes approximately 65 minutes.